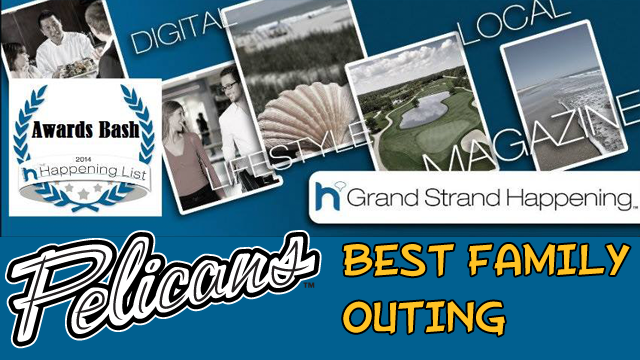 Grand Strand Happening name Pelicans "Best Family Outing"
MYRTLE BEACH, S.C. (SEPTEMBER 18, 2014) - Grand Strand Happening announced the winners of their "Happening List," and the Myrtle Beach Pelicans were named the "Best Family Outing" in the first ever incarnation of the award. The Happening List is a people's choice award list of Grand Strand Happening readers' favorite people, places, events, and businesses on the Grand Strand. The publication handed out over 100 different awards from "Best Day Spa," to "Best Sushi," and "Best Senior Living." The Pelicans beat out fellow finalists Brookgreen Gardens and Ripley's Aquarium for the Best Family Outing label. All of the winners will be honored at the first Grand Strand Happening List Bash on September 25. To view details on the event as well as the finalists and award winners, visit the Grand Strand Happening website. The Pelicans have provided top-flight family entertainment at TicketReturn.com Field at Pelicans Ballpark since the team's inaugural season in 1999. Stadium Journey ranked the Pelicans in the Top 25 Stadium Experiences in all of sports in 2012 and 2013 as well as third in Minor League Baseball in 2013. The club has been nominee for the Golden Bobblehead Awards, which honors the best promotions in Minor League Baseball, in three seasons, and the Pelicans have three nominees for the 2014 season. Focused on entertainment, the Pelicans are also committed to the community and, this season, won the Community Service Award from the Myrtle Beach Area Chamber of Commerce. After donating $397,187 to the community in monies and man-hours in 2013, the Pelicans surpassed $465,000 this season. The Pelicans return to TicketReturn.com Field at Pelicans Ballpark in 2015 for their 17th season, and first as the Class A-Advanced affiliate of the Chicago Cubs, looking to defend their Southern Division Championship. For information on tickets to see the Pelicans in 2015, please call (843) 918-6002, e-mail info@myrtlebeachpelicans.com, or visit www.MyrtleBeachPelicans.com.